Which is reflecte in the price as well as some other top features. The magnetic resistance and carbon blue drive are the 2 top features of the bike. They’re quiet and very low maintenance. And are a couple of reasons it is popular in commercial gyms across the country. In fact many people may already familiar with the bike if they’ve taken spinning classes. Being low maintenance and quiet are two good things when looking for a spin bike or indoor cycle trainer for the home too. As well as wanting top performance from it especially at the premium price. The aluminum frame helps keep the bike’s weight down but it is also strong and sturdy. There’s no flexing or bending under the strain of your workouts at any intensity. It keeps steady as you workout in and out of the saddle and moving in between. You can just get on with your training and workouts. If there is some rocking side to side you can level up the bike by turning the 4 levelers under the stabilizer bars. The bike has one of the widest adjustment ranges around with it being able to be adjusted to fit people between 4 ft 11 ins and 6 ft 8 ins. These adjustments should make it possible to get the best possible fit for you and if you have a road bike you should be able to get close to the same set up. The horizontal adjustments allow you to place the seat and handlebars exactly where you want – when you get it you just tighten them into place. With the vertical positioning you have less flexibility as you need the pop-pin to be inserted into nearest pre-set hole to the position you want. They are about 1/2 to 1 inch apart so there is plenty of scope to get close to the best position for you. The handlebars are a lightweight design that makes it much easier to move them up and down to get the fit you want – it stops the struggle with the weight. There are makings on the poles and sliders that help you set up the bike quickly if it has been adjusted since you rode the bike. Making the adjustments is quick so it is possible for multiple people to use the bike. It doesn’t really get in the way of your workouts – only a slight delay at worst if you have to adjust back to your settings. The 6 magnet resistance is controlled by using a tension knob on the frame in the same way do with those that use friction pads. In this respect it works the same way. You can easily turn the knob as you workout to the amount you want. The adjustments are incremental and continuous in the same way too. The resistance increase works smoothly. It goes from very easy to very hard with plenty of room in between too – so no going from easy to very hard in a quarter turn. The 6 magnets ( 3 on each side of the flywheel) are moved closer to the flywheel to increase resistance and further away to reduce it. It does this without ever touching the flywheel. So there is no wear and tear on them and there is no noise. There is no need to replace pads like there is with friction pads reducing maintenance requirements. There are no levels marked so you have to make the changes to resistance by estimate which is how most spin bikes work (unless you buy the console and upgrade).If following a Spinning DVD will talk about adjusting it based on turns or your estimate of intensity. It can make it difficult if you’re not to return to previous setting. If using it for training you need to work this out for yourself the amount you want to set it at for your hill work. Most people can get used to it fairly quickly and if you buy the upgrade console it lets you know the resistance (called gear with it marked from 1 – 36). The belt drive is different to other bikes available with belt drives. It is thicker, more durable and has a construction that makes riding with it closer to a road bike with a chain. The belt is reinforced with carbon fibre that makes it longer lasting and with less stretching than other belt drives. You should get many years of trouble free workouts and training. There won’t be any maintenance requirements. The belt won’t stretch so you won’t notice any variation in performance and if you have a computer installed the readings will be consistent. To make it more like the experience of riding an outdoor bike the belt has looped teeth running across the belt. The belt runs across sprockets so you get that familiar variation in pull you get on a road bike as the belt moves across them. So you are getting a more authentic road bike feel to your workout that is very quiet and low maintenance that will outlast other belt driven bikes due to the carbon fibers and thickness of the belt. The flywheel weighs 37 lbs which gives it the inertia to keep the pedals turning over smoothly at all levels of resistance. It has a fixed gear which helps with pulling through the pedals to give that rolling down the road feel and keep your feet moving as you move up and down on the bike. However, it does mean you can’t coast as you would with Smart Release. When the flywheel is turning so are the pedals. It can make getting off the bike a little difficult. You can stop the pedals by gradually bring them to a stop or by pressing down hard on the tension knob to use it as a brake. This is the usual arrangement for spin bikes and indoor cycles. The pedals are dual with toe cages and SPD fittings. You can use your specialist shoes to clip in to the cleats on one side or wear athletic shoes to slip your foot into the toe cages and tighten the belt to hold them in place. This does make it so that if the bike is to be used by more than one person who have different goals and gear they can use the bike – not everyone has to have specialist shoes. But, if you want you can change the pedals anyway for you own with it having standard thread. The Q-factor (horizontal distance between the pedals) is 170 mm which is wider than you get on road bikes but fairly good for spin bikes. So, it may feel a little unusual and your legs won’t feel as aligned. It may add just a little stress to the joints because of the alignment. If you think this may be an issue you can check out the Spinner NXT which has 158 mm Q-factor for a more natural feeling but it comes with a chain and friction resistance – it is about $500 less when I checked (it has a chain drive). Seat. It is a little larger than a standard bike seat and padded for comfort and balance. But as with every seat out there (I think) it’s not going to be for everyone. Some will like it, others may find it too painful and other will in between. It is all down to personal experience. You can try a gel seat cover and/or padded bike shorts if you are one of those who suffer from the seat. This is often enough. Or, if not or just due personal preference you can replace it for a seat you prefer as it fits standard fitting bike seats. They are flattened out at the ends to make them easier to grip, as is the crossbar so that there is less pressure in the arms when you are leaning on them. There is a rubberized grip covering them to provide a better grip to stop hands from slipping or blisters forming when hands get sweaty. The angle of the handlebars can’t be adjusted. Noise. It operates very quietly with only a whisper hum from belt drive as it moves over the sprockets being the only think you might hear. Heavy breathing is the loudest noise to be heard coming from the bike. You can easily hear the TV over the bike. If you are working out next to a bedroom you are unlikely to disturb anyone sleeping in there including children. If you are in an upper floor apartment your neighbors won’t know you’re working out – but if you are concerned about any vibration or movement being noticed then putting the bike on a rubber exercise mat will provide the added protection needed. Cleaning Up. The bike itself won’t cause much in the way of dirt and dust. But there will be some cleaning up to do. This is going to be the sweat. Despite all the features to help prevent rust it’s still important to wipe the bike down to remove sweat as this is very corrosive and will eventually start to corrode the bike. It is advised to do this after each workout and it only takes a few seconds. Also, sweat is likely to drop on the floor and you may want to put the bike on a rubber exercise mat to keep it from being affected by sweat. If you haven’t got a home gym and need to use in one of your rooms you may want to store it out of the way when not in use. It needs an area of 51 ins by 21 ins for storing. It’s not likely to fit in a closet but it is a good light color (pearl white) which gives it some eye appeal -so won’t be annoying if left out or stored against a wall. It should look good for a number of years too with the rust proofing and other features like the guards and pads on the stabilizer bars and frame to prevent it getting scratched by your shoes. It has 2 transport wheels at the front of the bike that you can tip the bike on to when you want to move it around. They don’t work that too well on soft surfaces such as mats and soft carpets. They work much better on harder surfaces although on wood floors you may find they scratch or dent it (so it’s a good idea to test this first). The bike is delivered part completed. It has a shipping weight over 113 lbs. Completing the assembly takes about 1 to 2 hours. Most people find it straightforward but you do need take a little time to study the instructions. The manual can be a little confusing with it including Schwinn AC Sport assembly instructions at the same time as well as having multiple languages listed together. There are short videos online (5 minutes. long) you can watch that help with it. The hardest part of the assembly has been completed – with the drive and frame put together You are required to add the stabilizer bars, pedals, seat post, seat slider, handlebars post, handlebars slider, seat and handlebars. It is going to be easier if there are 2 of you doing this mainly because of the weight of the bike especially moving the box and holding it still while the stabilizer bars are being attached. The bike does not come with a console which is a little surprising considering the price. Not everyone wants one or has a use for it (hard for me to understand this!). There are 2 different consoles and 1 upgrade that are designed to be used with the bike which makes fitting and set up easier. M Power Echelon 2 Console measures RPM, heart rate (with compatible heart rate strap, stage time and total time including average and max values. It works with an Ant+ strap. You can also upload your training data using a Ant+ device such as a sports watch or by plugging a USB stick into the console for upload into your fitness account. You can set up a user profile for more personalized measures. It requires 2 C Batteries. There is an on/off switch and has a button to push when you want to backlit the display for reading in poor light conditions. M Power Echelon 2 Console Power Upgrade measures RPM, heart rate (with compatible heart rate strap, stage time, total time, gear indicator, power (watts) and calories. This works he same way as the M Power Echelon 2 Console except with the additional measures. It has a position sensor for reading the angle of resistance mechanism and is used to calculate the power. You can also have a gear indicator displayed of 1 – 36 if you choose to turn it on to help you choose the gradient you want and makes it easier to return to one as you might do when riding the same route outdoors. Cadence Pro measures RPM, average RPM, heart rate, average heart rate, % of max heart rate, training time, exercise session time, distance and calories. You need to supply Ant+ or polar heart rate strap if you want heart rate measurements. You can set up your own profile for more accurate measurements – age, weight and ambient heart rate. It user 3 AAA batteries for the console and 1 CR2032 (coin style battery) for the flywheel transmitter. It is backlit so can be seen when lighting isn’t great. You can find the Ant+ products they are compatible with by going to the Ant+ website. The bike doesn’t have its own App nor is it compatible with others to use as you workout. You could fit a bike computer to it instead if you prefer but that will take more DIY skills to fit to the handlebars and the spoke magnet to the flywheel. There’s not a lot of accessories that come with the bike. You get dual water bottle holders. And that’s your lot – there’s nowhere for your phone or media devices unless you use the water bottle holders or handlebars. The water bottle holders are in between the handlebars putting them in easy reach. The bottles are gravity held so there is no having to slide bottles in and out of place – you can get your drink without having to slow down. The holders are oversized so can fit any size bottle – so, no need to stop to get a refill! You can buy triple-link pedals separately for the bike which is a two side pedal. On one side you can fit Look style cleat shoe (not Look Keo) or athletic shoes with a toe cage the other side you can use a SPD style shoe cleat. This bike doesn’t have a huge amount of customer reviews online, But those that have been left tend to be positive with 87 % rating it a 4 or 5. So, overall it is very well liked but a few weren’t so happy. The main negative review is about the poor assembly instructions and not seeing the value in the carbon blue belt for home use. It was noisier than expected too which was mentioned in a couple of other reviews. The assembly instructions are a little confusing but I don’t think they should cause too much problems if you read through them properly – the assembly process isn’t difficult. As for noise most people find it very quiet with it making very little noise – just slightly more than you hear with smooth drive belts. The rest of reviews talk about how well it performs – its smooth, consistent, quiet and comfortable it is apart from the seat in some cases – but that comment on the seat is to be expected. Included in the price is a very durable bike that is low maintenance with the carbon fiber included belt and magnetic resistance and dual pedals. It rides well too – it seems to have stood up to the tests of being used regularly in commercial gyms across the country as it is the bike of choice for a number of them. There is a chain drive version of the bike that costs under $2,000 – it requires more maintenance and isn’t as quiet but in other respects it is much the same bike. Read more about it here. When I checked Amazon it qualified for Prime and free shipping. 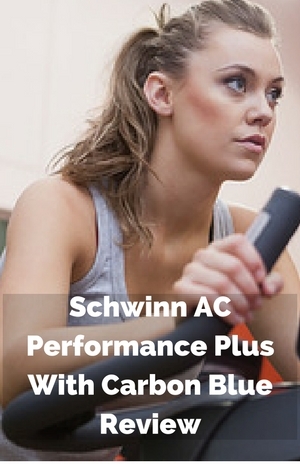 The price of the Schwinn AC Performance Plus With Carbon Blue makes this a bike for those who take their training seriously and want to be using it regularly. It can certainly take this level of use. But it can be used by people who are beginning or want a moderate level of exercise (but if that is all that is wanted a more affordable bike might meet their needs to). It does mean it can be used by more than one person and they can have different requirements. Using in the home is great. It’s quiet, it looks good and can be moved out of the way if you need to. It can easily be used multiple people. It’s not cheap and it would have been great if it came with a console for keeping track of your training and workouts. So, you can get in your training when you want and can be used by those road riders wanting indoor training without putting their road bike on a trainer or for those who want serious spinning workouts. What shoes with built in cleats do you suggest for the Schwinn Carbon Blue? The pedals take shoes with SPD cleats. Regarding the console and watts. How often is it recommended to calibrate wattage and how accurate is it? It is recommended you calibrate it once a month. Marketing on this model claims a wide range of people size use, fitting people from 4’11” through 6’8″ in size. I’m just 6’3″ and there was no way I could adjust the seat slider to my proper fit on the horizontal adjustment. Vertical fit was not a problem. I have been cycling (road and mountain) and indoor spinning since 2006. I have never experienced this flaw with other commercial spinning bike brands to include Lemond, Star Trac, Core, Kieser. I spoke with the spinning instructor, other class participants and customer service rep for Schwann products and all agreeded of the limited seat slider range. I’m just wondering if the seat slider needs to be positioned opposite for tall riders (seat/saddle back and adjustment knob forward). Sorry, I meant customer service support for Schwinn products. Did you try customer support? I have purchased 16 carbon blue but already experiencing a problem with 3 bikes, pedals/cranks have started slipping like that feeling when chain has slipped so have to take out of class, how do I repair please. That’s not good. Contact schwinnfitness.com for help with repair and troiubleshooting. I hope it goes well.